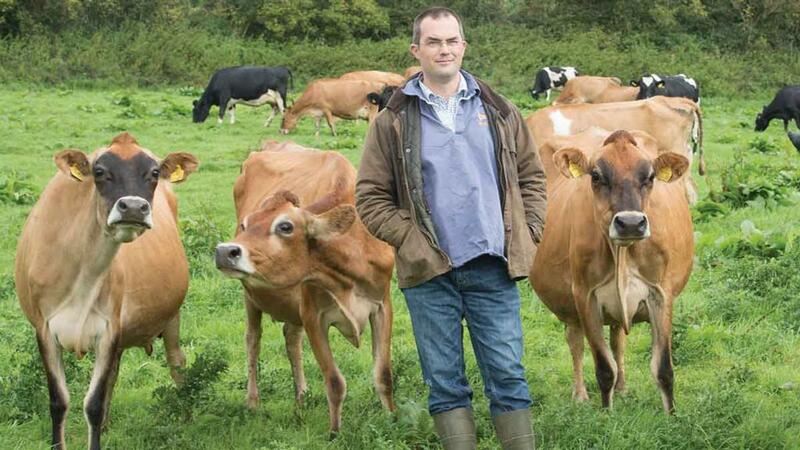 New entrant dairy farmer Jon Stanley farms an 82-hectare (203-acre) council farm, renting more land near Shaftesbury. Married to Clea, with two children, he runs a 180-head spring block calving herd, mostly pedigree Jerseys and cross-breds. Milk is sold to Barber’s cheese. The farm also hosts a Woodland Forest School and he won ’new entrant, against the odds’ at the 2013 British Farming Awards. After watching everyone making first cut silage in ideal conditions, we managed to mow ours as the rain started. We did actually need some rain after a prolonged spell of dry weather as it was starting to make grazing a bit of a juggle. We did graze most of the silage ground before shutting up for silage, but not all this year. We are therefore a few days later than most and still usually silage in the third or fourth week of May. We looked at the longer range forecast for the Bank Holiday weekend and the week after, which looked very wet and changeable, so we decided to mow with a 40 per cent chance of rain. As the mower went into the last field the heavens opened and we had 15mm overnight when 4-5mm was forecast. The following day, thankfully, was very drying and we scrambled to get the silage picked up, finishing at 2.30am and trying to avoid the heavy rain amber weather warning. The following day was beautiful, so our haste was not necessary. Sod’s law springs to mind. Anyway, we ended up with a massive heap of great quality silage with the clamp totally full. We will make bales for second cut to rebuild the reserves after last winter. Hopefully the regrowth will bounce back with the heat and rain and take the pressure off the grazing ground as stocking is high until silaging is done. I managed to get my Basic Payment Scheme application in without too much bother this year with only a few field changes, so let’s see how the Rural Payments Agency gets on. I also submitted my ’ten penneth’, for what it is worth, to Defra’s Health and Harmony consultation along with a fair few others. I hope it makes some difference. I was also pleased to receive confirmation to say we were successful in our application for a Countryside Stewardship water capital grant for cow tracks. These will hopefully fill in the jigsaw of our grazing paddocks so we can access them all by suitable tracks. Now we are up to full numbers in the milking parlour we are saving at least an hour per milking which was the original plan of the project. As it is half term we have decided to head down to south Devon for a week’s break, but given the roads down here it looks like everyone else has done the same.